The Bank of the West Business Rewards Credit Card currently has an Informr score of 8.6 out of 10. This score is based on our evaluation of 1 sources including reviews from users and the web's most trusted critics. 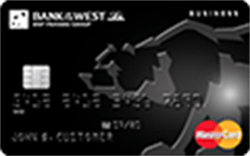 Bank of the West Business Rewards Credit Card is typically available to those with good credit scores (650 or greater). It’s not too hard to earn this bonus and the points can be redeemed for rewards later on. Additionally, you can receive 1X points back on all your purchases and get 25% automatic rebates on select purchases at participating locations.